"There is a place in our hearts for Grenache at Bonny Doon Vineyard," states the winery's new website. "It is the misunderstood, Ugly Duckling cépage par excellence." 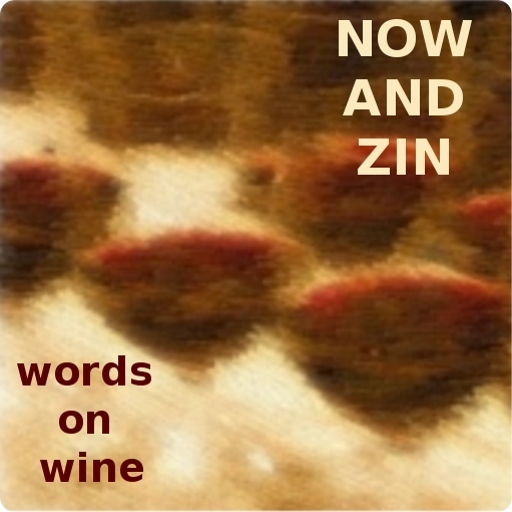 The Now And Zin California Grenache series threw the spotlight on this misjudged, maligned and magnificent grape. 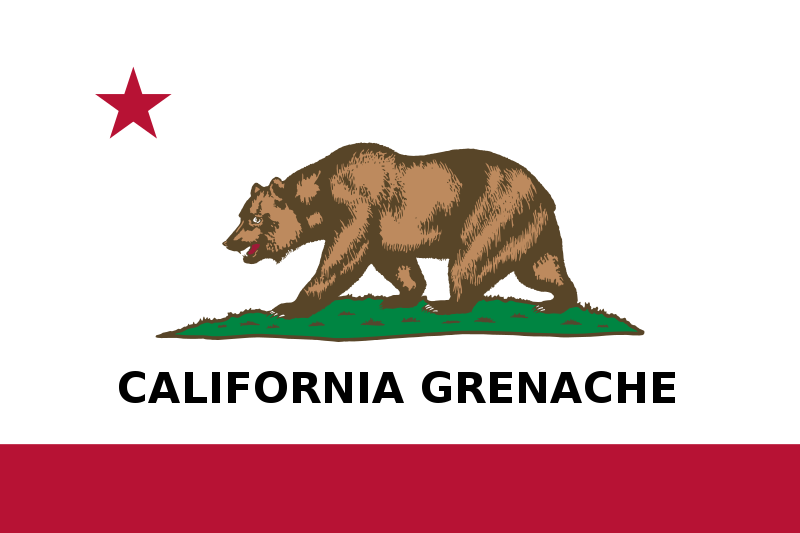 The grapes for the Bonny Doon Grenache Cuvée R 2012 were grown in the Rancho Solo Vineyard, formerly the Ca' del Solo Vineyard in Monterey County town of Soledad. Winemaker Randall Grahm says he has planted it at the new vineyard in San Juan Bautista. "It looks promising." Grahm says, "This was the most impressive single batch of Grenache fruit I have ever chanced to encounter chez Doon." And he has encountered quite a few. If you want to get downright geeky about the grapes, Grahm reveals that the fruit for this wine was grown "from a selected clone of Grenache alleged to have originated from an extremely well-regarded, let’s rephrase that, from the most well-regarded domain in Châteauneuf-du-Pape, one known for making 100% Grenache cuvées of atypical elegance." It retails for $48, but is only available to Bonny Doon’s DEWN Club members. Cuvée R rocks a 14.9% abv number, so it’s a rather potent quaff. The label art cartoon by Gary Taxali is worth at least a portion of the price. The Cuvée R Grenache is extremely dark, with no light getting through the glass. Upon opening, the nose was rather tight, a situation that resolves itself over time. One sip makes it clear this is a very tasty, dark and delicious wine, but it’s not a big ol' California fruit stand. This Grenache is dark, like the forest. A nice level of acidity is refreshing in the mouth - but not the sort that takes your breath away - and the tannins are firm, provide a lively mate for meat. Actually, the tannins seem to increase over the three nights I had this bottle open - quite the reverse of what I would have expected. On the first night, the wine seemed a little dull, blunted. On the second night it was a much livelier experience and by the third night it was brighter still. The wine is full in the mouth and smooth as a bonus. Not a bad choice for the holiday table. If Syrah is for suckers, as some marketing types would have you believe, then include me in. I'm a sucker for Syrah. I love the austere and funky feel of cool-climate Syrah maybe just a tad more than I love the big jammy kiss that warm-climate Syrah lays on me. But I'm a sucker for both ends of the Syrah spectrum. I love Syrah from the Rhône Valley; I love it from Argentina; I love it from the rolling hills north of Santa Barbara; I love Syrah from Tuscany and Texas, from downtown to upstate, from Natchez to Mobile, from Memphis to Saint Joe, wherever the four winds blow. Someone told me once that I should have named my site "Now And Syrah," which would have been worthy of consideration had there been any sense to the phrase. The folks at Cornerstone Cellars, who provided the Stepping Stone Napa Valley Syrah 2012 for review, are of the belief that the southern Napa Valley is an exciting region for Syrah, and who am I to argue? Their Black Label Syrah project seeks out mature Syrah vineyards that can produce wines with a distinct personality, unique to their site. Cornerstone's Managing Partner, Craig Camp, says "in 2012 that led us to the heights of Atlas Peak and the Soda Canyon Vineyard. This is a classic mountain syrah," he goes on, "with depth and power balanced by a fine structure and rich tannins. Certainly this is Syrah that will reward those patient enough to cellar it." I wish I were so patient. The yields from the rocky well drained soils of the mountain vineyard were rather low, so only 160 cases were produced, in addition to a couple dozen magnums. Barrel aging took place over 18 months in French Burgundy oak, 40% of which was brand new. Retail is $40. Camp notes that 2012 was a classic vintage, offering "a steady parade of glorious, warm sunny days and cool nights which allowed the fruit to enjoy long, even ripening. The Stepping Stone Syrah is very dark, in color and style. Aromas of cassis, tar, meat, tobacco and a whiff of smoke come together in tantalizing fashion, showing the effects of that new oak. There is a very dense feel in the mouth, full and rich, with blackberry, plums, black pepper, sage, nutmeg and eucalyptus. Vibrant acidity and pronounced tannins really serve food pairings well, and the herbal sensations last on the finish, which has great length. Cornerstone recommends it with braised meats, but you can make mine a ribeye. It's a beautiful experience. I was asked to reprint an article about the #DineSmall effort for Small Business Saturday Night, which is coming up on November 29, 2014. Many people will be out doing some holiday shopping that weekend, and hopefully helping their local economies by patronizing small business. The Small Business Association is jumping on social media with the #DineSmall campaign. They are asking shoppers who dine out to keep the thinking behind #SmallBizSat in mind when selecting a dining option. The article,by SBA Administrator Maria Contreras-Sweet - actually a blog post published on sba.gov on November 20, 2014 - makes the appeal very well and is republished here in its entirety. "November 29th is Small Business Saturday – a day circled on the calendar of savvy entrepreneurs across America. "Small businesses are the engine of our economy and create two out of three new jobs. Seven in 10 Americans are now aware that the day after Black Friday is a time to shop small and support local economic growth. This year, the SBA is helping to expand this important day into the evening to support entrepreneurs in the food and beverage industry. "This year, America’s bars and restaurants are extending the hours on the daylong festivities by promoting Small Business Saturday Night. The SBA is partnering with the National Restaurant Association to encourage families who shop small to #DineSmall at local restaurants and watering holes in the evening. We’re also encouraging small business merchants to extend their hours so they can take advantage of increased nighttime foot traffic. "Nine out of 10 restaurants have less than 50 employees, and 80 percent of restaurant owners start their careers in entry-level positions. So the #DineSmall movement is this year’s important new way to support the proprietors who give Main Street its unique flavor. "Now in its fifth year, Small Business Saturday has become a time for small businesses to harness the power of social media to attract new customers into their shops and restaurants. Last year, two out of every three holiday shoppers purchased a gift they found on social media. Half of all holiday sales now are influenced by digital interactions. Purchases may still be happening predominately in person, but the influencing is happening online. Social marketing is virtualizing what has always happened on the soccer field and over the backyard fence. "To grow momentum this year, I’m inviting restaurants to promote #DineSmall by sharing their special menus for Small Business Saturday Night. 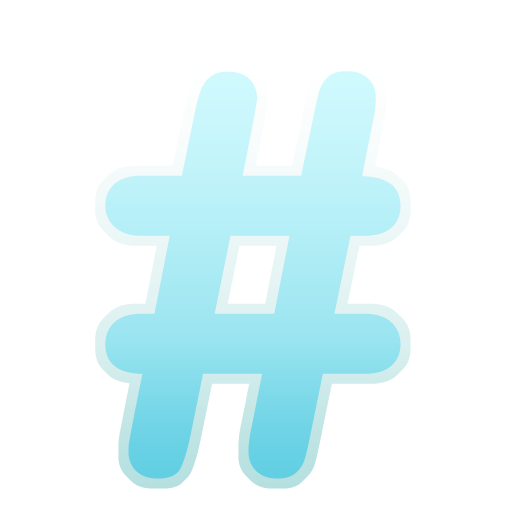 Owners and chefs are invited to share their menus on social media using the #ShowUsYourMenu tag. It’s a great way to promote what your restaurant is doing to cater to America’s small shoppers. "We all have a stake in seeing foot traffic increase on Main Street; local spending means local jobs and local growth. Holiday shoppers shouldn’t let Nov. 29 pass without investing in your local economy, and entrepreneurs should have a multi-pronged strategy to use this day to drive food and beverage sales and showcase your local business. "Join the conversation today on Twitter (#SmallBizSat, #DineSmall and #ShowUsYourMenu) and spread the word about Nov. 29 and what a big difference shopping and dining small can make." 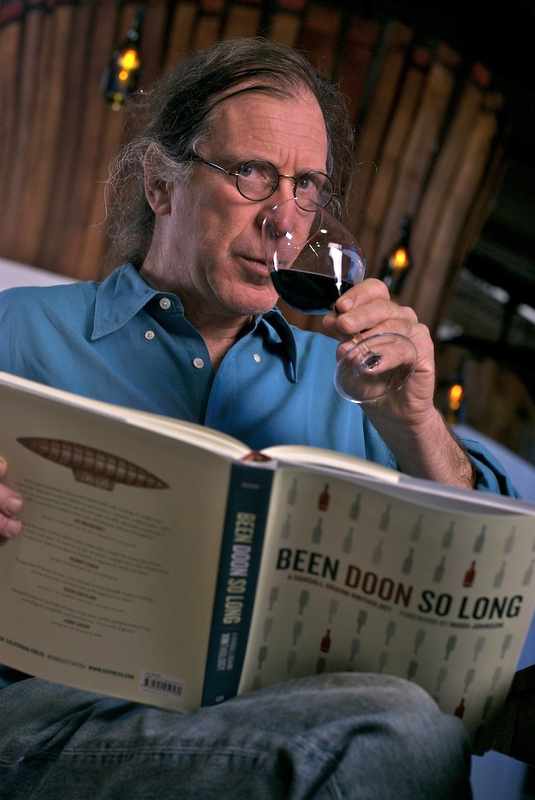 Randall Grahm's Bonny Doon Vineyard has been providing holiday-worthy wines for more years than I have been drinking them - at least more years than I have been obsessed with them. Grahm - the eloquent Rhône Ranger - has his own obsessions with which to grapple. A pioneering spirit if there ever was one, he is currently obsessed with growing grapevines from seeds, rather than from cuttings. His experimentation in that arena is rather new, so there's nothing to report. Yet. Being late in the year, he has been keeping himself busy lately with the rigors of harvest and the business of bottling his latest releases. 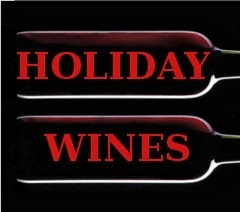 It is those we put forth as suggestions for your holiday table - or your holiday chair, if you prefer. The man's wines are not only a cinch to pair well with food, but they also go down real well in sipping and thinking mode. "Harvest 2014 came and went like a freight train through California, and apart from apocalyptic intimations of drought-related devastation/ruination, it was a very good, relatively abundant, if not preternaturally early vintage. (55% Roussanne, 26% Grenache Blanc, 19% Picpoul) We've made a very slight label change with this vintage. An echo of the mineral character that we were able to express in the wonderful '11, but perhaps a tad richer on the palate. 1,965 cases produced. (48% Alamo Creek, 18% Bien Nacido, 18% Spanish Springs, 16% Ventana) From a number of cool climate sites, a fair amount of whole clusters included, this is a savory Syrah of great restraint. 2,126 cases produced. (75% Grenache, 17% Syrah, 8% Mourvèdre) Grenache from the impeccable Alta Loma vineyard in the Arroyo Seco (a relatively cool site in every sense), a rather textbook Grenache, with a lovely mineral aspect. 3,400 cases produced. (46% Cabernet Sauvignon, 17% Merlot, 15% Tannat, 13.5% Petit Verdot, 7.7% Syrah, .8% Petite Sirah) Nothing of course "proper" about this wine; it is the febrile imagining of what a restrained, elegant Cabernet-based wine might taste like in the New World. 15,920 cases produced. (28% Syrah, 22% Grenache, 17% Cinsault, 17% Mourvèdre, 16% Carignane) Continuing in our series of "Burgundian" vintages of Cigare with old-vine Cinsault playing a very important role in keeping the Syrah in check. Yes, Carignane ain't a proper grape for faux-Châteauneuf. We knew that, (but it does provide the wine a nice steely exoskeleton). 1,344 cases produced. This wine began life as precisely the same wine as the "normale," but was subject to élevage in glass, which has imparted a most unusual textural element and a great degree of savoriness. (Yeast lees are very rich in glutamate.) 547 cases produced. (56% Carignane, 17% Syrah, 15% Grenache, 11% Mourvèdre, 1% Cinsault) Some (former) colleagues and wholesalers were not so keen about the old "couch label" and persuaded me to change it to something a bit slicker and more commercial (perhaps too kool for skool?). We added a bit of cool climate syrah and grenache to the very old vine Carignane and Mourvèdre.4,720 cases produced. This is a "special" selection of Grenache grown at what was formerly our "Ca' del Solo" Vineyard in Soledad, and is available exclusively to our DEWN Club members. It seems to produce an extremely complex and concentrated Grenache. (We're planting it at our new vineyard in San Juan Bautista and it looks incredibly promising). 593 cases produced. The ultra-consistent older Block X, planted with the "Estrella River" clone of Syrah (I suspect without any foundational evidence that it may actually be "Serine"), produces an extremely peppery, bacon-fat version of Syrah, far more consistently than modern clones. 463 cases produced. (52% San Benito County, 48% Monterey County) From the Wirz Vineyard in San Benito and the Ventana Vineyard in the Arroyo Seco, this is a Kabinett style with 3% residual sugar. 2,912 cases produced. (100% Grenache Blanc) Not air-dried, frozen or botrytised, this is just very late harvested Grenache Blanc, but has appropriately enough, taken on a certain honeyed/beeswax character. 987 cases produced. (Méthode traditionelle) It's lately been an aspiration of mine to explore the wine styles that are most challenging to me. I've always adored the idea of Sparkling Syrah (or Shiraz), but even James Halliday couldn't find one that I could abide. Maybe it's maturation on my part or just a sudden shift in consciousness, but this is one I adore. 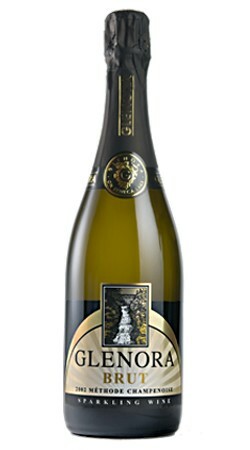 Only one small caveat: The wine is very, very fizzy, so please open with caution. 378 cases produced."